But movements can counter him. Donald Trump, who has never been shy about demanding that the media do his bidding, now has the power to shape the rules that define the future of newspapers, broadcast media, and the Internet. Trump’s appointees are already employing the regulatory-agency equivalent of executive orders to gut programs that would ensure net neutrality, expand broadband access, guard against consolidation of media ownership, and enforce disclosure of sources of spending on political ads. “This is what government by billionaires and special interests looks like,” says former Federal Communications Commission chairman Michael Copps. This article is part of a special issue of The Nation on “Media in the Trump Era,” available online in full on March 2. Within days of assuming the presidency, Trump named Ajit Pai as his FCC chair. A former associate general counsel for the Verizon telecommunications conglomerate, Pai was one of the FCC’s five commissioners during the Obama era. In that role, he often dissented against consumer-friendly regulations, robust market competition, and diversification of media ownership. 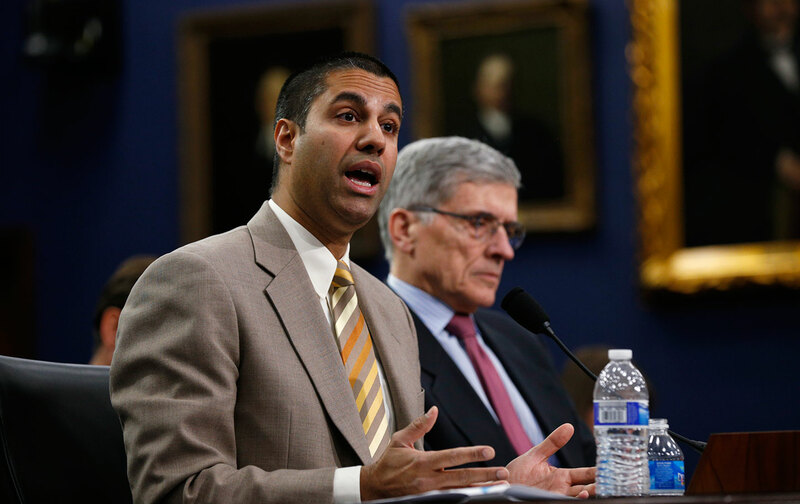 Now, as FCC chair, Pai has moved rapidly to undo Obama’s FCC legacy, reversing or weakening measures that had begun to restore the commission’s commitment to regulating on behalf of the public, rather than the corporate, interest. Pai speaks Trump’s language, promising to “fire up the weed whacker” to shred regulations that media corporations and the right-wing media echo chamber have long opposed. He also mimics Trump’s disdain for democratic process. Pai and his aides have employed “delegated authority”—a claim of power to act without public input, hearings, or votes by the full commission—to advance their agenda. In one case, they killed the FCC’s guidance to broadcasters on “shared service” agreements, an initiative to guard against media companies’ operating two or more stations in markets where there is supposed to be competition. In a second case, Pai pulled the FCC’s set-top-box proceeding, which would have brought competition to the cable market by enabling independent manufacturers to sell the set-top boxes that otherwise are provided by cable companies. Pai also undermined a program to protect prisoners from profiteering off their calls home and scrapped a plan to expand broadband access for low-income families. (“Rather than working to close the digital divide,” Mignon Clyburn, the only Democratic commissioner remaining on the FCC, said of the latter move, “this action widens the gap.”) Pai rejected a report from the FCC’s Homeland Security Bureau on cybersecurity risk reduction, leading FCC watchdog Dana Floberg of Free Press to accuse him of “willfully ignoring reports and analyses that don’t bolster his preferred agenda of scaling back the FCC’s congressionally granted power.” Pai also withdrew a requirement that noncommercial stations file data that helped the FCC monitor the diversity of media ownership, and he set aside orders that made it easier for the FCC to sanction broadcasters that violate the agency’s political-advertising disclosure rules. Pai has been an outspoken foe of net neutrality, the first amendment of the internet that guarantees the free flow of information without censorship or corporate favoritism. With Trump’s backing, and that of a Congress whose Republican leaders never say no to telecom giants, Pai will have an FCC majority and plenty of leeway to go after net neutrality. Its “days are numbered,” he says. Activists predict that he won’t stop there. Through formal actions by what will be a Republican-controlled FCC and by granting of waivers that allow corporations to get around cross-ownership and joint-sales rules that were designed to maintain competition in local television markets, the FCC could end up facilitating media mergers and monopolies at the national and local levels that will be devastating to competition and to the democratic discourse. In addition to zeroing out funding for the National Endowment for the Arts and the National Endowment for the Humanities, the Trump team has reportedly discussed “privatizing” the Corporation for Public Broadcasting. At present, the CPB funnels roughly $445 million a year of federal money to the nearly 1,500 public radio and television stations of the NPR and PBS networks, as well as to community stations around the country. A tiny portion of the federal budget, this $445 million makes a life-and-death difference for rural and small-town radio and TV stations that are indispensable sources of news and intelligent programming. That’s the point, of course. Trump ally and former Speaker of the House Newt Gingrich has long attacked public and community broadcasters that provide an alternative to the dust storm of alternative facts that has blown across America since the Gingrich-backed Telecommunications Act of 1996. That measure, a classic example of what goes wrong when corporations and self-serving politicians of both parties write the rules, unleashed a wave of ownership consolidation that shuttered radio newsrooms, silenced local talk, and welcomed the big-media syndication frenzy that made Rush Limbaugh ubiquitous and coverage of state capitols and school boards scarce. At a time when the United States should be supercharging public and community media to prevent development of news deserts where the only “information” comes from partisan corporate outlets, Trump and White House chief strategist Steve Bannon are dusting off the playbooks of the 1990s. Schemes to weaken competition and diversity, to create one-size-fits-all “newsrooms,” to set-up digital fast lanes for subsidized content and slow lanes for democratic discourse—all were proposed back then. But they were beaten back—beaten by popular movements that built remarkable left-right coalitions and forged innovative legal strategies that surprised their wealthy and powerful opponents. When the George W. Bush administration advanced a media-consolidation agenda, the outcry from three million Americans who contacted the FCC played a critical role in preventing it, according to then-commissioner Copps. When the FCC asked for public comment on a controversial net neutrality proposal in late 2014, they received nearly four million responses, almost all supporting stronger federal regulation. In February 2015, when the FCC voted in support of net neutrality, the voice of the people was cited as a decisive factor.